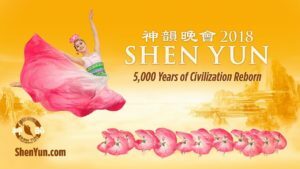 I attended this performance expecting an amazing Chinese cultural extravaganza, with a sprinkling of political messaging about the persecution of the Falun Dafa (aka Falun Gong) religion in China. After all, this program is sponsored by Falun Dafa. I came away feeling that I’d just witnessed an overhyped, entertaining, colorful, charming, naive, heavy handed religious propaganda piece. This has been HEAVILY advertised for months online and off. Tickets were expensive – 2 X the nearest equivalent: Cirque De Soleil. The testimonials in the advertisements were so adoring that unless it really was on the level of Cirque De Soleil, some level of disappointment was inevitable. But it was not that level – far from it. They’ve clearly poured millions into this to build five independent troupes worldwide constantly touring and rehearsing a new show every year. This looks like the main propaganda machine of the Falun Dafa religion. The costumes were stunningly beautiful, matched to the painted backgrounds – it was quite lovely. And the integration of on-screen action and stage action was amazing. It enabled the dancers to move from one world to the other almost seamlessly – quite brilliant. The visuals were the most impressive aspect of the show. Charming, perfectly executed but not outstanding. They would have looked like competent amateurs alongside the Bolshoi Ballet. I seriously doubt that this is the best there is in Chinese dance performance. It was much more like a series of often catchy pop songs than a powerful rock opera. Nothing sophisticated here, but we didn’t come expecting Petrouchka. Some hilarious moments, especially from the girl who wanted to keep dancing when she was supposed to finish and her comrades had to carry her off. The enemy, Chinese Communist Party thugs, were not even two dimensional – closer to one. An enemy with no motive who is simply evil by nature weakens a story, making it impossible to identify with the villains, and therefore harder to empathize with the protagonists. Storytelling 101. Unremarkable. Not a single melody caught my attention. And the opera singer was dire. See below. The messaging was heavy handed, unsubtle, dogmatic and at times laughably idiotic. Not really a perfect fit for the sophisticated, unreligious UC Berkeley audience. It started off light with a bit of heaven and meditation and a story about a soldier who renounced war to become a monk. All quite charming and fun. But as we progressed further into the show, first the politics and then the religion were slathered on ever thicker. This began with a heavy piece showing Falun Dafa youths being beaten and arrested, tortured and blinded by communist goons. I don’t doubt that in reality their followers have faced this and probably worse. Then Buddha appeared and blessed the devoted followers of Falun Dafa and it ended happily, at least in the story. We were now drifting out of the realm of meditation and some traditional ideas about Buddha and heaven, into ‘Buddha saving his persecuted followers’ territory. This escalated to a moment of extraordinary direness in an operatic performance. The lyrics were translated on screen. The singer praised the creator and went on about heaven for a while. Then he sang to us with overblown earnestness about how corrupting modern life is and how we should not fall prey to the delusions of atheism and evolution (I’m not making this up) but should follow the teachings of Falun Dafa. Only by following the teachings of a Falun Dafa teacher can we get to heaven. It really said that. I was so embarrassed I didn’t know where to look. The song wasn’t much good either. In the last scene some kind of deity appears and destroys the corrupt worldly communists by conjuring up a cataclysm. I felt that I’d been magically transported, not into some delightful Chinese flower filled heaven, but into the Buddhist equivalent of Christian apocalyptic nonsense. I could only laugh when the persecuted religious devout dancers held up a naive little banner saying, “Falun Dafa is Good”. Clearly Falun Dafa is suppressed in China, probably more brutally than this entertainment piece cared to depict. There are claims of mass executions for the purpose of organ harvesting! But reference to that might have spoiled the vibe of a pleasant evening. But I fear that the utterly nuance-free religious fanaticism only served to undermine the trust and sympathy of the audience. If had not known from other sources of Falun Dafa’s persecution this performance would have left me thinking they were exaggerating. The repeated claim that you ‘can’t see this kind of dance in China’ seems dubious. I’m sure that is true that you can’t see something like this, wrapped in layers of religious fanaticism and anti-government propaganda. But I really doubt that traditional Chinese dance is banned in China. Shun Yen looks to me like a misguided attempt to gain public sympathy for the political persecution of Falun Dafa. Which, on its own, would be a difficult target to miss. But by adopting a second, simultaneous goal of ramming their religious teachings down the throats of the audience they seized defeat from the jaws of victory. I’m wondering how they could be so naive as to think their religious dogma might appeal to this audience. Two possibilities come to mind. Their actual target audience is overseas Chinese, not white guys like me. I imagine that is where their funding comes from. They probably get a ton of money from Taiwanese anti-communist sympathizers. But for the American born Chinese at least, I doubt that the unsubtle religious message held much appeal. They simply have this massive blind spot and have no understanding of the psychology or intellectual norms amongst non-Chinese or even Chinese outside China . This seems a more likely explanation. After all, they hardly have a monopoly on ‘total lack of self-awareness due to religious dogma’. How else could they speak to an audience on campus at UC Berkeley, one of the most liberal, intellectual institutions in the USA, condemning evolution and telling them that the only way to heaven is to follow Falun Dafa, and that ‘Falun Dafa is Good’! The only reason they were not laughed off the stage is because a Berkeley audience also does not want to look culturally insensitive or unsympathetic to Falun Dafa’s un-debated political plight. I found myself wondering if I should offer my services to Falun Dafa as a PR consultant. I could easily improve their messaging by 1000%. But then I realized that the problem is one that they might be unwilling to solve. They don’t only want sympathy for their political plight. That’s an easy sell. They also want buy-in to their religious dogma. And that’s something I have no interest in advising them upon. I went into the Shun Yen dance performance full of sympathy for the Falun Dafa political cause. I came out with a clearer understanding of why the Chinese Government finds them as irritating as hell. Nevertheless, it doesn’t seem right to imprison and torture people just because they irritate you.